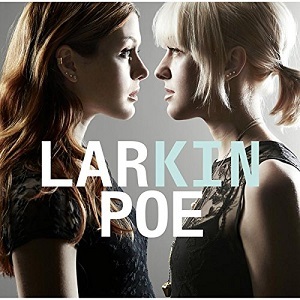 Larkin Poe takes their name from an ancestor of sisters Rebecca and Megan Lovell, who was a cousin of Edgar Allen Poe. They've released several EP's or collaborations, but "Kin" is their first full album. Since forming in 2010 the band has moved away from their early sound with it's country/folk influences to what's more of a rock sound with a pop influence. It's a diverse album that kicks off with "Jailbreak" featuring some lovely bluesy guitar and more of a pop vocal, before moving into "Don't" with a definite rock sound from that guitar riff and more solid drum sound, but again the vocals are light and upbeat - more rock than pop, but as with "Jailbreak", working well with the music. For me the whole album is great, but the best track has to be "We intertwine", a track taken from their "Sping" EP. It's got some of the best vocals from the album and also features some lovely guitar-work. I'd recommend checking out the album teaser video at the bottom of this review and getting a taste of what the album is like. "Kin" is a great album. The lead vocals are excellent, the songs are well written, and the music is played beautifully, particularly the guitars. It's all very radio-friendly, so don't be surprised if you hear Larkin Poe on the radio in the near future. Rebecca Lovell (electric / acoustic, mandolin, keys, violin, & lead vocals). Megan Lovell (lapsteel, dobro, keys, & harmony vocals). Robby Handley (bass, keys, & harmony vocals). Marlon Patton (drums / percussion).